Now that the election is over, it seems clear that each party had its own distinct message. Republicans, following Trump’s lead, went all-in on immigration, the wall, migrant caravans, crimes committed by illegals, fearsome Central American gangs, birth-right citizenship, appointment of conservative judges, and a sprinkling of self praise for tax cuts and deregulation. Democrats focused on access to healthcare, health insurance, protecting those with pre-existing conditions, the unfairness of the tax cuts to ordinary Americans, local issues, education, protecting Medicare and Social Security, and holding Trump accountable. Down the stretch the Republicans sensed that the healthcare issue was truly important to voters and that they needed a response beyond “Repeal Obamacare”. They then began to profess that they believed in access to healthcare, in protecting those with pre-existing conditions, and that they had a plan. The only problem is that they don’t have a plan, have never had a plan, and don’t intend to have a plan. The Affordable Care Act (ACA) is far from perfect. This is due, in large part, to the compromises President Obama had to make in order to get the bill passed. Deals had to be made with the pharmaceutical and medical device industries that prevent Medicare from negotiating prices. The health insurance industry had to be guaranteed a profit. This meant forcing healthy uninsured people to buy coverage which led to imposing a penalty for people who did not buy insurance and to government subsidies for those too poor to afford coverage. Had these deals not been cut, there is no doubt that these powerful entrenched interests would have killed the ACA before it was born. But, and it’s a big but, these same deals and many other structural problems in our health care system are making it difficult to control the ever rising cost of healthcare, which far exceeds the cost of inflation and far exceeds the cost paid by any other advanced nation for healthcare. Another problem is that of uncompensated care. Texas and other Southern states refused the federally subsidized expansion of Medicaid. This refusal occurred despite the fact that every stakeholder in the healthcare industry begged them to expand Medicaid. The refusal was purely political. Billions of dollars were left on the table and millions of people were left without any coverage. This means that hospitals, doctors and other providers are often paid nothing for their goods and services. Those unreimbursed costs are then passed on to those who can pay. This political showmanship comes at a very high cost to all of us, not just the poor. While campaigning, Republican politicians were saying they believed in protecting those with pre-existing conditions and believed in access to care, Ken Paxton, Texas Attorney General, filed a lawsuit in federal district court in Ft. Worth to try once again to have the ACA declared unconstitutional. That suit was joined by 20 Republican attorneys general of Southern states. If that lawsuit succeeds, millions will be without coverage and we will be back to square one with no Republican “replacement” in sight. Healthcare and health insurance issues have reached a point of crisis. While Texas politicians boast that Texas has the greatest economy in the United States, we also have the largest number of uninsured in the nation. 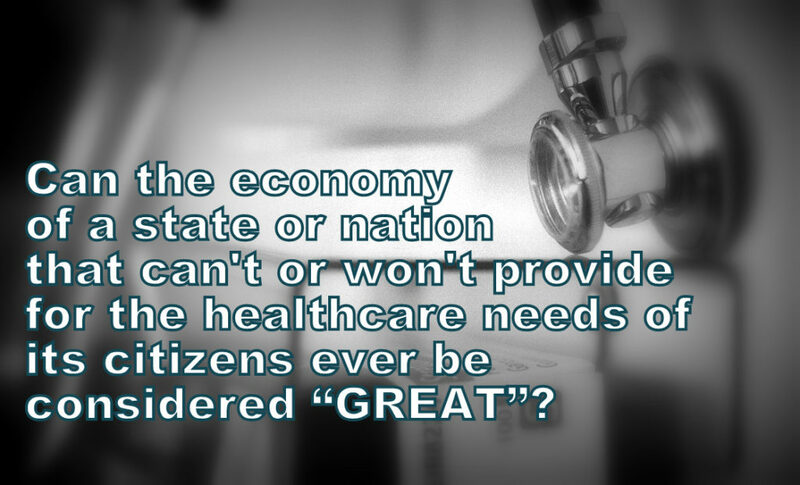 Can the economy of a state or nation that can’t or won’t provide for the healthcare needs of its citizens ever be considered “great”? Democrats will control the House beginning in January, but they won’t control the Senate. That means a legislative solution is far, far away. In the meantime, we will be at the mercy of political and economic forces beyond our control. Something has to give. Web Design by NorthStar Interactive Media, Ltd.